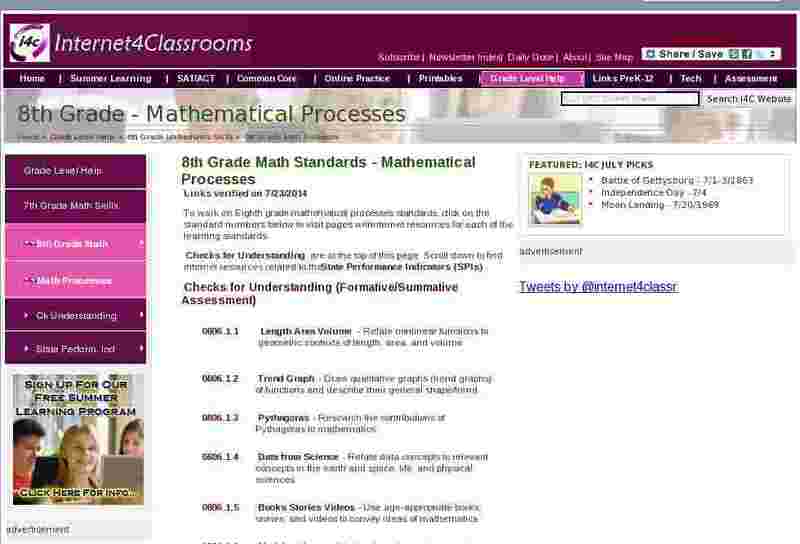 To work on Eighth grade mathematical processes standards, click on the standard numbers below to visit pages with internet resources for each of the learning standards. 0806.1.2 Trend Graph - Draw qualitative graphs (trend graphs) of functions and describe their general shape/trend. 0806.1.3 Pythagoras - Research the contributions of Pythagoras to mathematics. 0806.1.4 Data from Science - Relate data concepts to relevant concepts in the earth and space, life, and physical sciences. 0806.1.5 Books Stories Videos - Use age-appropriate books, stories, and videos to convey ideas of mathematics. 0806.1.6 Models - Use models (such as dynamic geometry software, patty paper and geo boards) to explore relationships among angles (complementary, supplementary, interior, exterior, vertical, and corresponding). 0806.1.7 Create Scatterplots - Use a graphing calculator or spreadsheet to create scatterplots of data and approximate lines of best fit. 0806.1.8 Real-World Problems - Use a variety of methods to solve real-world problems involving multi-step linear equations (e.g., manipulatives, technology, pencil and paper). SPI 0806.1.1 Distance Rate Time - Solve problems involving rate/time/distance (i.e., d = rt). SPI 0806.1.2 Qualitative Graph - Interpret a qualitative graph representing a contextual situation. SPI 0806.1.3 Cost per Unit - Calculates rates involving cost per unit to determine the best buy.